From tanning to manicures, every salon and spa knows how vital it is to clean up after using various nail and hair products. When it comes to appearances, your business's accessories should adhere to the polished image your salon and spa seeks to uphold. At Towel Super Center, we provide a variety of companies and industries with just the drying accessory they need — our premium microfiber towels. Choose from a variety of colors for an added sense of style! Gyms: Whenever your guests venture out to your fitness center or gym, their top priorities consist of building some muscle, engaging in cardio and strengthening their physique. While sweat is a necessary result of these activities, that doesn't mean unwanted moisture and dampness has to hang around even when the workout is complete. With 16" by 16" proportions, these towels are compact enough to offer at the front desk or placed throughout locker rooms for easy cleanup access. Car Washes: When your customers pull into your lot, they anticipate an experience that will leave their cars clean and shiny. You wouldn't skimp when it comes to the right soaps and waxes, so why not place the same level of emphasis on quality for your company's towels? Microfiber towels are excellent for scrubbing, shining and drying cars so that every vehicle emerges from your car wash a bright and sparkling sight that'll turn heads for the right reasons. Restaurants: From spices to sauces, there's no shortage of the list of ingredients that go into your delicious dishes and entrees. As the customers file in, and orders build up in the kitchen, it's inevitable that a mess or two will occur. 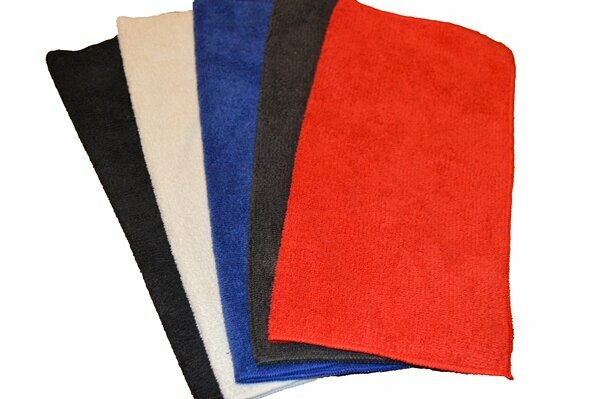 Quickly wipe up spills with fast-drying towels that easily repel stains and spots in the process. Hotels and Inns: Every time a guest walks in one of your rooms, make sure they’re walking into a space that upholds your hotel's image — towels included. Our poly-blend towels are soft, durable and quick-wicking so that your customers can fulfill all of their drying needs with added luxury. Barbershops: Make sure your clients never have to deal with uncomfortable positions when leaning their heads back against the shampoo bowl by investing in our soft and plush microfiber towels. Just slide one of our cushiony towels under each customer's neck before you begin to wash their hair so that they can relax properly. When you place your wholesale order for our premium microfiber towels at Towel Super Center today, you'll save yourself both time and money. Who doesn't enjoy discount prices on premium products that are made to last? Place your order online today for fast shipping straight from our facility to yours.